Madame Masque is the first of two Madame’s included in Wave Two of the Return of Marvel Legends. 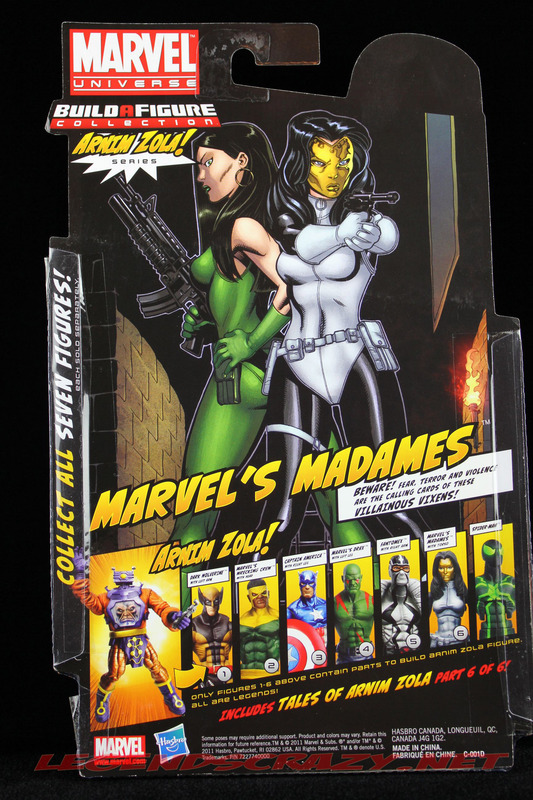 Madame Hydra is a running change or a variant meant to refresh the wave as it is replenished on the retail level and keep the customers returning to the stores to buy the variations. I think it is a great idea to have a variation of a figure which gives us an all new character with basically altering the paint decos and sculpting a new head. 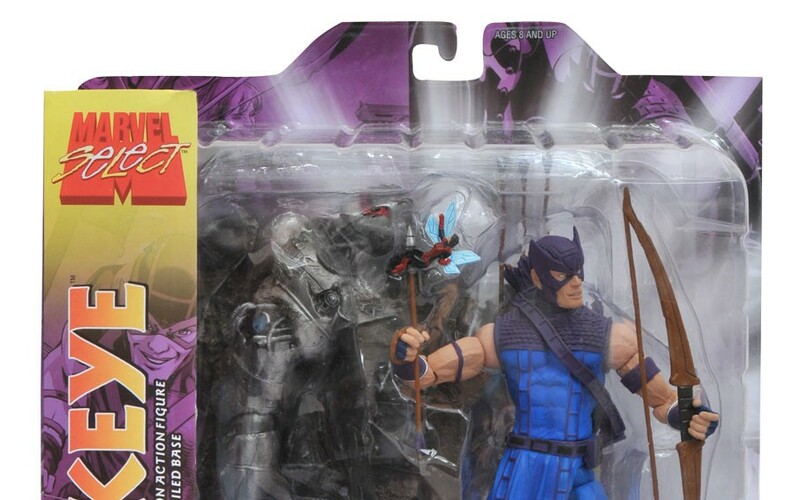 It is economical for Hasbro and we benefit by having a second character in the wave. Both the two Madame’s and the two members of the Wrecking Crew, Thunderball and Piledriver were to be running changes in this wave. 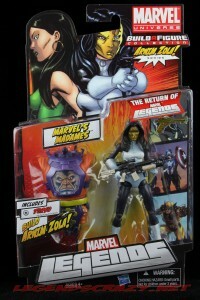 In an effort to get these first two waves of Marvel Legends out before the Avenger’s movie merchandise. We were treated to both Wave One and Wave Two being released within a month of each other and the running changes also shipped out together in both waves as well. The result was that we have added 24 figures, including the Build-a-Figures to our collections within a short span of a couple of months. I’m guessing that when the third wave comes out later this year, we won’t be seeing the running changes as quickly. 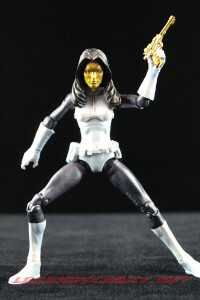 Madame Masque aka Whitney Frost has been both an enemy of Iron Man and a love interest since her character was introduced in 1968. 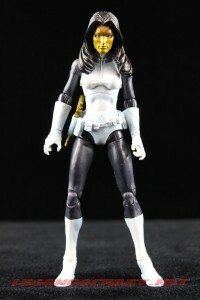 She is the daughter of a master criminal and heir to the Nefaria family branch of the Maggia crime syndicate. Her face was badly scarred in a plane crash, after that she began wearing a gold mask to cover her face. She has no super-human powers but is a skilled combatant in various martial arts, is an expert marksman and has a proficiency with robotics. She is mentally unstable and believed to be criminally insane. 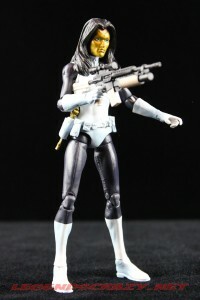 The figure is based on Hasbro’s current choice for all its recent female characters. 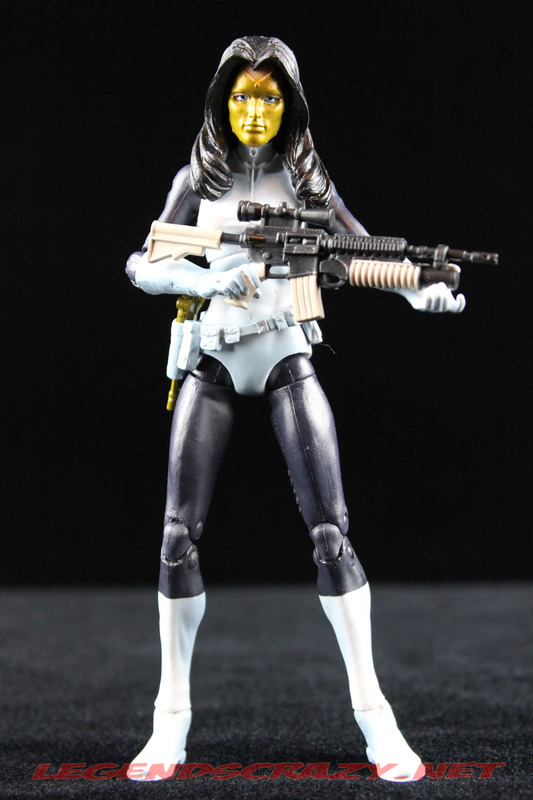 We have seen this buck used for Electra, Skrull Electra, Maria Hill, Sharon Carter, two versions of the Black Widow, Hope Summers and the Madame Hydra running change from this wave. I’m guessing we will still yet see this used for several more characters to come in the near future. It is a good female buck, but I would like to see some variety in the body styles and shapes of the female characters in the near future. The head-sculpt is very nicely done. 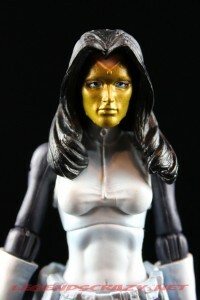 The mask is sculpted so it is slightly raised above the face and the rivets around the mask add a very nice touch. 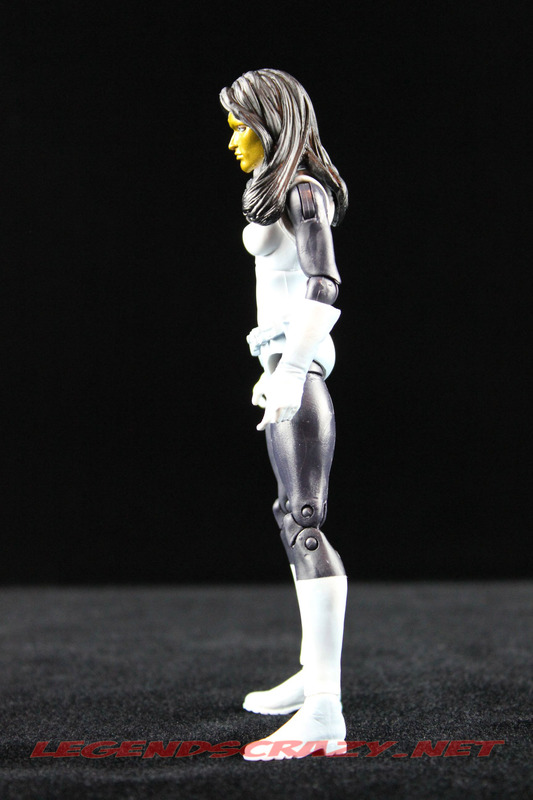 Her hair is rather long and drapes over both of her shoulders though, so you aren’t going to get the full range of motion from the ball-joint that you would on a shorter-hair female with this body. The hair also impedes her from looking up. You have to push her chest back further to make her head seem straight. 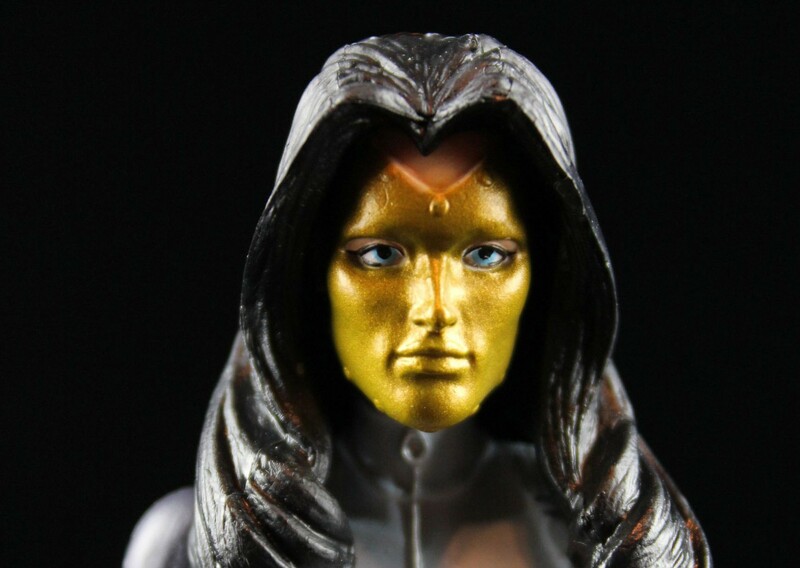 The hair is also very detailed but not highlighted with any other color like Madame Hydra’s. She has some blue over-spray airbrushing on the white parts of her costume. When viewing her from far away it adds some nice highlights, but up close it stands out a bit too much for me. She shares the same gun belt, hand gun and rifle with Madame Hydra as well. Hasbro did at least put forth the effort to differentiate the weapons by applying gold paint to Masque’s weapons and green to Hydra’s. She can hold the hand gun well, but the rifle doesn’t work as well. 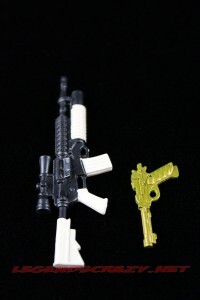 The rifles are the same version that came with the SHIELD Agents but the hand gun is new. 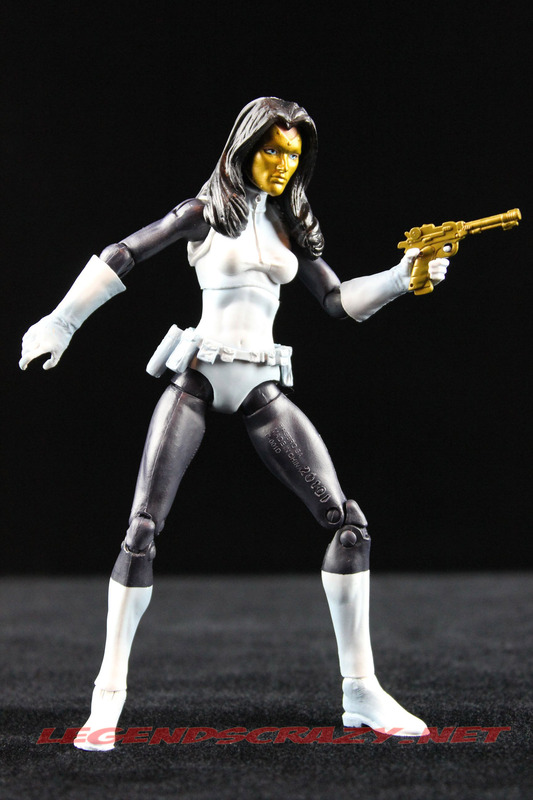 I think her action figure is much more accurate to her comic book counterpart than Madame Hydra’s. 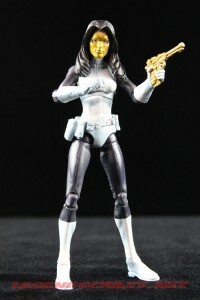 Hasbro does a better job at placing women into the mix of it’s collector lines than Mattel does. I give them kudos for that. For companies to consider female action figures to be a much harder sell, I hardly ever seeing them hanging on the pegs in mass. Well, except for Emma Frost, but we all know what happened there, right? 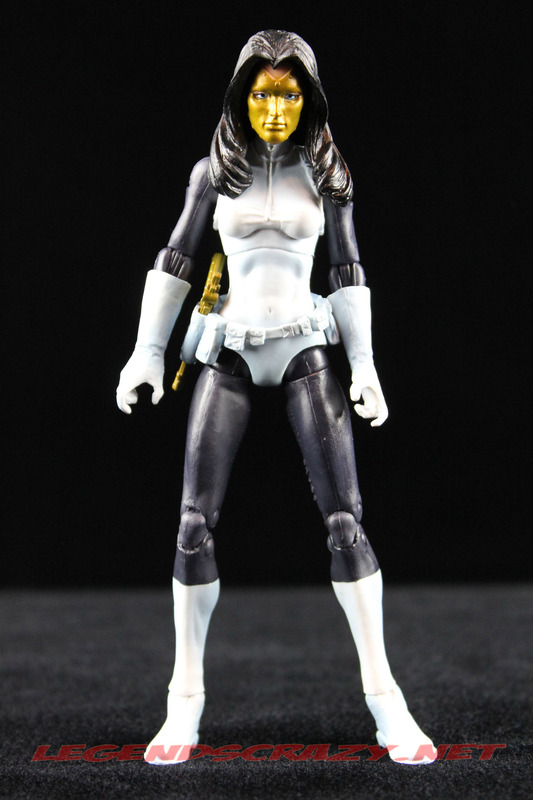 Madame Masque has a pegged ball-joint head, hinged shoulders, single-pegged elbows, swivel wrists (covered by the long gloves), mid-chest swivel hinge, the hinged upper-thigh cut, double-pinned knees and single-pinned ankles. She comes with a hand gun, a rifle and the torso for the Arnim Zola Build-a-Figure. Madame Masque comes with the regular Arnim Zola version of the Arnim Zola torso and Madame Hydra comes with the Red Skull running change version of the Arnom Zola torso. We’ll talk about that more when I get to Arnim’s review later in this series. I’m going to continue by taking a look at the regular versions of the figures from this wave and then I’ll do the variants and the running changes separately. So next up tomorrow is Thunderball. 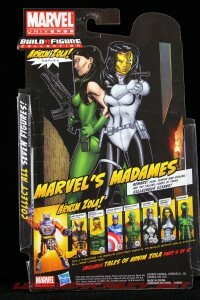 Stay tuned and don’t forget to let me know how you felt about Madame Masque in the comments.